You can register for the event here. The event is free for everybody. On the 2nd of June Italy celebrates its national day: The 2nd of June 1946 general elections were held in Italy. They were the first elections after 20 years of fascists regime and World war II; for the first time, Italian women were allowed to vote in a national election (http://en.wikipedia.org/wiki/Birth_of_the_Italian_Republic). To celebrate this day, IKIS invites you on Saturday the 2nd of June to an Italian party with grilled food, wine and live Italian music. From 3 pm at Kolonihagehuset in "Ramsvik og Rosenli kolonihage", Rasmus Risasgate 7, 4015, Stavanger (A few meters down the road from Midjord Bydelshus). Bring what you desire for the grill. We will have some salad and bread for free and some beverages (wine, beer, soda) for sale. You could also bring your own drinks if you wish. We will also have a raffle to cover some of the expenses. Prizes include dinner vouchers at Amici (http://www.amici-winebar.no/). 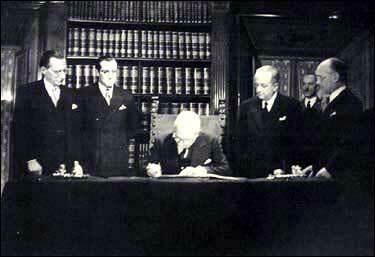 The provisional head of state, Enrico De Nicola, signing the Constitution by virtue of disposition XVIII.